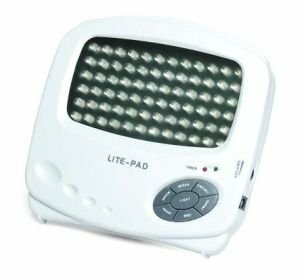 Lite-Pad sad lights cleverly use 72 extra bright LEDS, this makes them a very affordable and compact light therapy for seasonal affective disorder or anyone just wanting a light boost. These sad lights do away with those expensive bulbs which break, wear out and need replacing, instead using little LED lights like you see on electrical equipment, but many times brighter. 5000 lux of bright light. The LED lights are small too, by not having to house a glass bulb, each lite pad light box is reduced to 6 in x 6.5 in x 1 in, 16 x 15 cm. Reach for a ruler, this is impressively small. Small enough that you are actually likely to use the lite pad sad light on your desk or table rather than leaving it stored in a cupboard. There`s a built in timer as some people tend to bask off basking in the light. And if you want to bask off, there`s a choice of optional nature sounds. Sooth and re-energise away to the sound of the sea, wind, bird song, frog chorus, rivers or forest. Sad Lights text, images and video are copyright.